SSERVI’s DREAM2 team, lead by Bill Farrell at NASA’s Goddard Space Flight Center, has been researching the electrical conductivity of space suits. A space suit is like having your own personal spaceship! It is a multi-tasking outfit that allows an astronaut to explore outside the safety of a spacecraft, and it provides basic life support, a pressure vessel with thermal regulation and basic protection from the harsh space environment. But how well does it protect against “sticky” issues like dust adhesion, or harsh plasma and electrostatic environments? These are questions the DREAM2 team has been looking at to see what other aspects could be improved for the space environment. 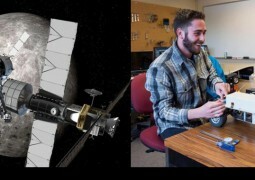 NASA scientists have long known about spacecraft differential charging issues. In the terrestrial magnetosphere, charging anomalies have been observed on the nightside, when the spacecraft is flying through the hot terrestrial plasma sheet or large current flows of the geomagnetic tail, where big negative ~10kV potentials have been reported. To keep spaceship circuitry from being zapped, engineers have figured out ways to mitigate electric charging issues. Wrapping the spacecraft in a highly conductive skin, like gold foil for example, will help reduce or eliminate differential charging. These days it is common practice to require the skin of a spacecraft to have strict conductivity requirements. Part of the DREAM2 thinking is that these requirements should extend to space suits as well, given that they are also exposed to the space plasma environment. The space plasma environment at the space station is different at the Moon, which has densities over 1000 times lower, so this may require greater connectivity of the suit to the plasma by expanding the conducting area. 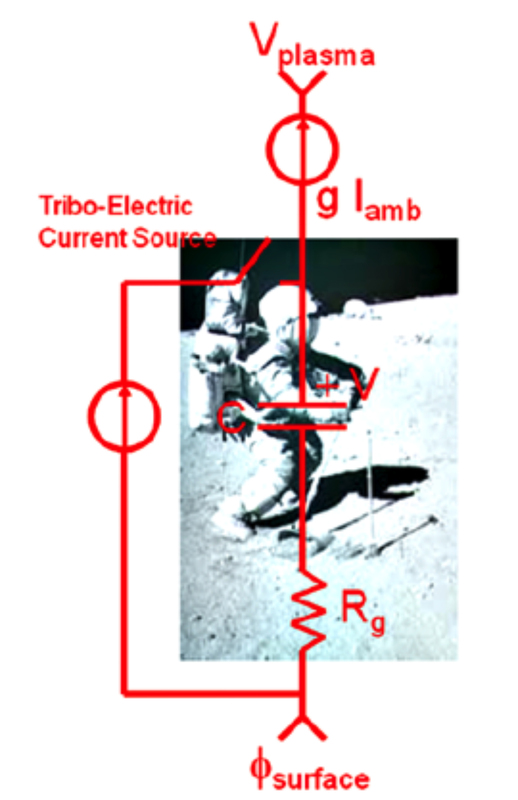 It turns out that an astronaut moving over the lunar surface creates a tribo-electric charge—similar to the way shuffling your feet across the carpet builds up static electricity. 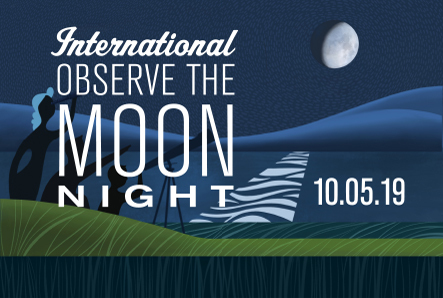 The Moon is a very poor conductor, so the astronaut is actually grounded to the free reservoir of charge in the local plasma, and not to the lunar surface. On the dayside, photoelectrons and solar wind ions are a conductive medium and provide a good electrical ‘ground’. The copious amounts of charge particles in the environment provide a reservoir of charge to remediate any charge build-up. However, on the nightside (and in shadowed areas) there are reduced plasma currents or no photoelectron currents at all, which leaves the astronaut effectively ‘ungrounded’, allowing a possible build up of electrostatic discharge for a roving human. Charge build up is possible if the time scales for charging by roving and rubbing over the surface exceeds the time scales for plasma dissipation and neutralization – which DREAM2 research suggests may be happening in shadowed regions. 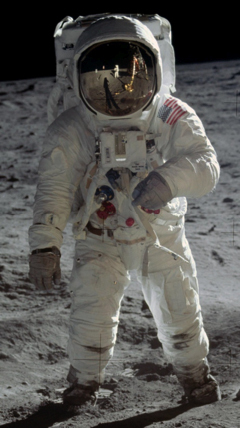 The Apollo 12 AL7 suit was multi-layer with the outer skin made of woven Teflon, which is an insulator and a strong tribo-electric charge generator when rubbing against most material, especially granular minerals common to lunar regolith. These insulating fibers can entrap dust either electrically or mechanically—it turns out that we wrapped the astronauts in a woven material ideally suited for collecting dust! Close up microscopic inspection of dust grains in the woven fibers of the suit. Credit: NASA/TP-2009-214786, Christoffersen et al. NASA’s newest spacesuit design, the Z-2, is a surface-specific EVA Garment still in development at NASA’s Johnson Space Center. The DREAM2 team is in discussions with the JSC team to refine requirements and concepts for the suit’s environmental protection garment to have spacecraft-like plasma conductivity requirements that better connect the suit to the electrical ‘ground’ defined by the plasma. 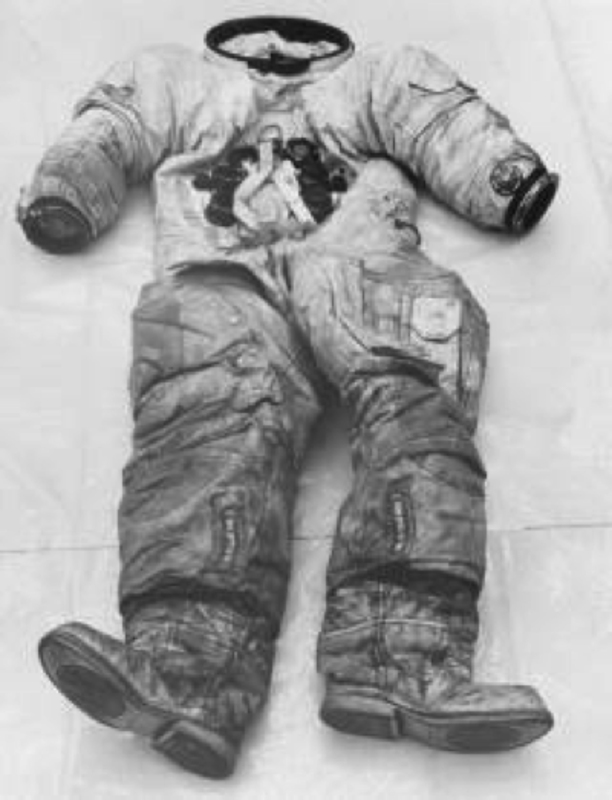 The DREAM2 team is now working on more detailed roving astronaut models, which NASA can consider as a step to making better, safer suits for our astronauts. “Incorporating plasma protection into the space suit design is an opportunity to both improve safety and to demonstrate some exciting new technology,” said Amy Ross, lead of NASA’s advanced pressure garment development team.